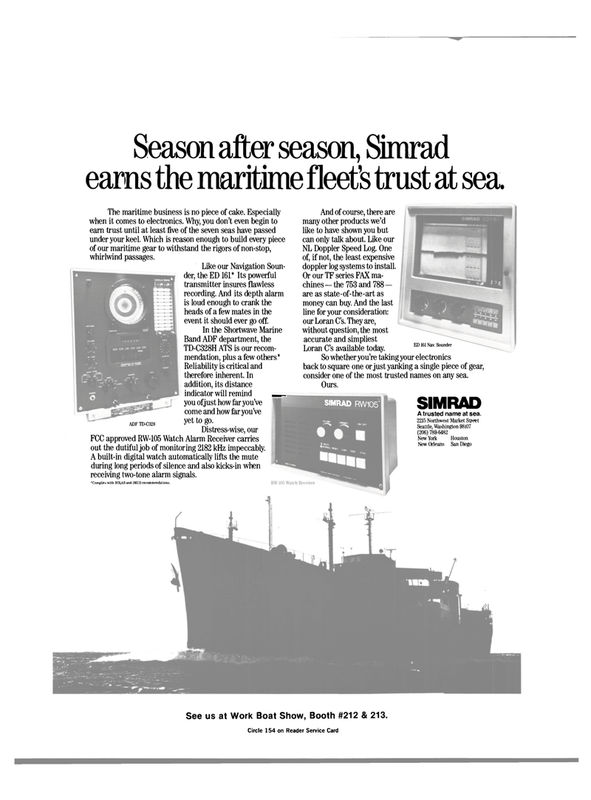 Season after season, Simrad earns the maritime fleet's trust at sea. The maritime business is no piece of cake. Especially when it comes to electronics. Why, you don't even begin to earn trust until at least five of the seven seas have passed under your keel. Which is reason enough to build every piece of our maritime gear to withstand the rigors of non-stop, whirlwind passages. Like our Navigation Soun- der, the ED 161* Its powerful transmitter insures flawless recording. And its depth alarm is loud enough to crank the heads of a few mates in the event it should ever go off. Reliability is critical and therefore inherent. In addition, its distance indicator will remind __ you of just how far you've come and how far you've yet to go. FCC approved RW-105 Watch Alarm Receiver carries out the dutiful job of monitoring 2182 kHz impeccably. A built-in digital watch automatically lifts the mute during long periods of silence and also kicks-in when receiving two-tone alarm signals. NL Doppler Speed Log. One of, if not, the least expensive doppler log systems to install. So whether you're taking your electronics back to square one or just yanking a single piece of gear, consider one of the most trusted names on any sea. New Orleans San Diego 'Complies with SOLAS and IMCO recommendations. See us at Work Boat Show, Booth #212 & 213.